In celebration of their upcoming North American Tour, VAN HALEN performed a special concert on Jimmy Kimmel Live! on March 30th on Hollywood Boulevard. Featuring some of the band’s essential rock and roll classics, the concert was broadcast over two nights (March 30th and March 31st) on the late night talk show and it marked VAN HALEN's first US television performance with original lead singer David Lee Roth. Now, a video which compiles the band’s performances on Jimmy Kimmel Live! can be seen below. VAN HALEN kicks off a North American tour on July 5th in Seattle, Washington at the White River Amphitheatre, with concerts scheduled through October 2nd in Los Angeles, California at the legendary Hollywood Bowl. Special guest KENNY WAYNE SHEPHERD BAND will support all dates along the tour. Tickets for the Live Nation-promoted tour are on sale now. A complete list of tour dates can be found right HERE. 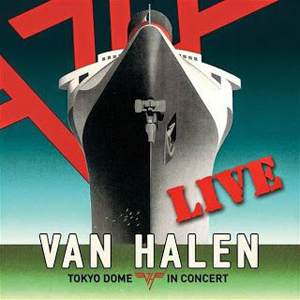 The special Hollywood Boulevard concert was a hit-heavy set of songs featured on Tokyo Dome Live In Concert, the first-ever live album to feature original singer David Lee Roth. Recorded on June 21, 2013 in Tokyo, Japan, Tokyo Dome Live In Concert includes 23 songs spanning all seven of the band’s albums with Roth. It is available as a double CD, four-LP set on 180-gram vinyl and digitally. Remastered versions of Van Halen and 1984 have also been released, with remastered versions of Diver Down, Women And Children First, Van Halen II and Fair Warning due out later this spring. Each album has been cut straight from the quarter-inch tapes for CD, 180-gram vinyl and for the digital version by mastering engineer Chris Bellman, who remastered the original albums for Bernie Grundman Studios, Hollywood, CA. Go to Van-halen.com for more information.